Pug Bella The Pit Pet Fashionista is available in paperback on Amazon. Bella is a happy-go-lucky pug living an everyday dog’s existence until fate intercedes. When her boy, Zachary Tinkle, starts racing a minicup stock car, the trajectory of her life changes. It starts with just taking photos of her in a car and suit that matches Zachary’s race car. Then, Bella gets to go to the racetrack by happenstance. Traveling to the race track so that she can greet fans along with garnering attention and belly rubs becomes one of her favorite things to do. Word gets out about Bella while Zachary’s racing career grows to his racing a full size late model race car. Magazines feature Bella and Zachary’s relationship. She has cameo appearances in books. And, there were hero cards featuring her and Zachary. 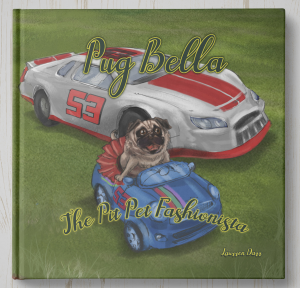 Listen to Bella tell her story of how she has become known as the racing ‘Pit Pet Fashionista’ in this delightful book written from a pug point of view.